top Republican on military matters, warned Friday. "Afghanistan has become a major source of tension between the United States and India, for the primary reason that India does not believe we will stay until the job is done," McCain said at the Carnegie Endowment for International Peace. go to school and play with their friends. Of all cargo that flows into Afghanistan, about half (50%) transits Pakistan. There are two main border crossings between Pakistan and Afghanistan, Chaman gate and Torkham gate. 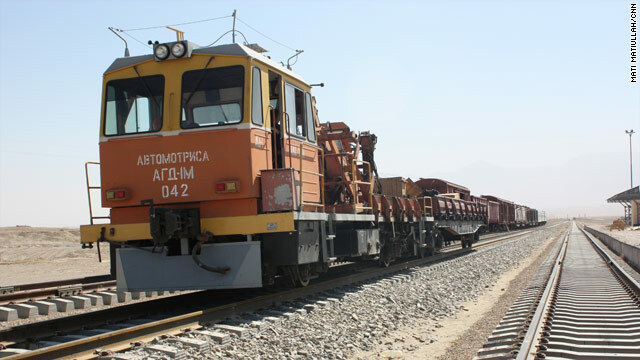 About 30 percent of all cargo flows into Afghanistan via the Northern Distribution Network (NDN) and transits Kazakhstan and Uzbekistan. There are two major routes on the NDN, one through Russia and the other through the Caucasus. The NDN is used to bring commercial-type cargo (sustainment items like food and spare parts) to U.S. troops serving in Afghanistan. The NDN does not replace routes through Pakistan, but provides additional transportation options for General Mattis and General Petraeus, and helps prevent any specific route from becoming a single point-of-failure for Operation Enduring Freedom logistics. The remaining 20 percent of cargo is brought into Afghanistan by air. Most of this cargo is sensitive, which includes such things as weapons, ammunition and critical equipment. Maylanie Shorter sleeps with a T-shirt tucked in her pillowcase. It carries the scent of her father's cologne while he's on patrol in Afghanistan. Her younger sister, Ariana, sleeps with her Daddy Doll - a stuffed soldier that displays a photo of her father across its face. At 14 and 10, the two girls try to maintain normalcy. They're active in school, they help with dinner, they rally around their mother. And they show no mercy for Pops over the Silver Star he earned by saving several comrades whose armored Humvee was shredded by a roadside bomb. They tease him about a photo of the burned-out vehicle. "How did you take this picture? Weren't you supposed to go get them and help?" Ariana says.